Since its establishment in 1967, PLANTEC INC. have created many original technologies regarding incineration plant and flue gas treatment systems through untiring research and development for over 50 years. We have delivered hundred and several tens of incineration plants and obtained over one hundred patents and utility model registrations in Japan and overseas. We will continue the effort to preserve the environment by utilizing and improving our technology and know-how of incineration plants. A digest version of BS Japan broadcasting program on October 28, 2017. 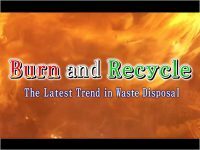 Plantec Inc. “Burn and Recycle” the latest ternd in Waste disposal.